Grease. Or, Not Washing My Hair Every Day. — deep hunger, deep gladness. Grease. Or, Not Washing My Hair Every Day. Man, oh man, have I had an embarrassment of riches this week. First, Jordan took over the blog with his epic rafting/Deliverance tale, and now my precious friend Mary Frances is taking over to tell a slightly less adventurous, but equally as harrowing, tale. I bet most women who read this blog will relate: the process of training your hair to not be washed every day. Since the pictures of her in this blog post are...we'll say "less than flattering," I pulled some pictures from her website so you can see how adorable she is (and how adorable her dog, Porter, is. I mean, COME ON with that). 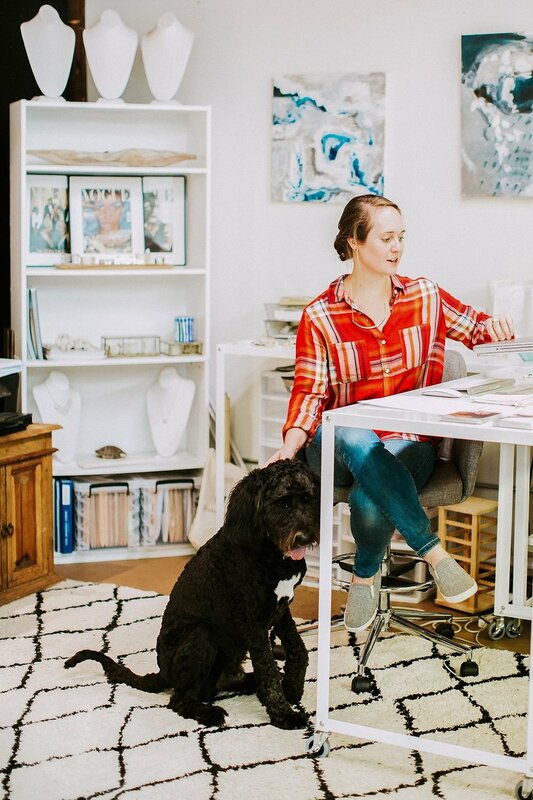 Mary Frances is a jewelry designer whose studio is in West Asheville (visit her incredible website here). Jordan and I met she and her boyfriend, Hobbs, at church one Sunday. Since then, Fran (as she's called by the cool kids) and I have bonded through our three-times-a-week Pure Barre dates. One day a couple of weeks ago, a few of the PB girls were discussing hair care regimens. I'll let her take it from here. I wash my hair every day, or at least every time I shower. Apparently it’s not good for your hair. At my last haircut, the stylist gave me a big “shame on you” speech about how I shouldn’t. What.Ever. Sometimes I skip a day, but honestly, it’s rare. Unless I’m camping or without access to a shower, these locks get shampooed almost every single day. I have pretty thick hair, or so I think, so you’d think it wouldn't get greasy easily - well, you’d be wrong. For a while now (okay, like, a week), Mary Catherine and a friend at Pure Barre have been telling me that they wash their hair just a couple times a week. So, I decided to try it. I washed my hair the night before “Day 1” began. 7:30 AM - Hear alarm go off. Look at the clock and realize it’s too late to get up, get dressed, pour coffee, feed the dog, take said dog to daycare, and get to Pure Barre by the 8:30 class. Look at PB app and see Mary Catherine is teaching the 9:45 class. Book it and roll back over. 9:40AM - Get to Pure Barre. 10:00AM - In the middle of plank position, remember what MC and I had talked about last week. Decide today’s the day I’m going to try it - I won't wash my hair every day this week. I figure, I’ve got nothing to do this week, so why not? I mean, let’s be real, I work for myself, usually from home - who do I have to impress? 12:00PM- Take a shower post-PB. Stand there wondering what the heck I’m supposed to do in here if I can’t wash my hair. Wash my body twice for good measure. 12:46PM - Text MC asking what she suggests I do in the shower since I can’t wash my hair. She tells me to stand there unmoving and then buy dry shampoo. 4:40PM - Feel my hair that I decided to air dry and notice that it’s still not dry. Text MC again. 5:00PM - Pick up dog from daycare and discover that he somehow has gotten some poop on his back. Remember that Porter only shampoos his hair when he gets groomed, which is only every 6 weeks, and his hair is angel soft. Thinking more and more about how that stylist may have been right. Consider bathing Porter when we get home to remove said poop. Remember that we just moved into an apartment that is mostly carpeted and decide against it. 5:15PM - Get home and use baby wipes leftover from my niece’s visit a few weeks ago to wipe away poop (it was just a tiny bit, I swear!). Decide beyond a doubt that Porter will not sleep in the bed with me tonight. 10:50PM - Look at hair one more time in the mirror. Decide that tomorrow, I'll dry my hair post-shower rather than air dry and see if it makes a difference. 11:00PM -Throw hair on top of my head. Snug with Porter in bed. 7:30AM - Wake up raring to go. Snug the pup one last time before getting up and dressed for the 8:30 PB class. 7:45AM - Check hair in the mirror. Notice “cute” top knot from previous night has turned into a top knot mullet. Take hair down to brush + redo for PB and see large crease in hair a few inches from my forehead. Cringe. Throw hair back up in top knot. 8:45AM - Midway through plank, remember I’m not allowed to wash my hair in my post-workout shower. Cringe again. 10:00AM - Go to “Luke’s” with Mary Catherine. 11:00AM - Get home, ready to shower. 11:25AM - Lay on the floor with Porter remembering that he only washes his hair every 6 weeks. Try to convince myself that this is actually a good idea. 11:45AM - Turn the shower on and get a little sad remembering that I’m not allowed to wash my hair again. Consider doing it anyway because #yolo. 11:47AM - Get in shower and decide against the shampoo. Stand under the water wondering, once again, how people who don’t wash their hair every day waste the appropriate amount of time in the shower. 11:52AM - Get out. Kidding - I stood, unmoving, under the hot water for at least 10 minutes. 12:15PM - Begin drying hair. Get halfway through and realize that it’s not drying. Oh, right. Grease. Throw it back up in a top knot, half dry and all. 12:17PM - Notice hat in the corner of room and decide that should I choose to go in public today, that hat will most certainly be on my head. 12:30PM - Consider buying dry shampoo. Forget and go to work. 12:45PM - Get to work and remember I forgot the hat. Hope I don’t see anyone I know today. 4:45PM - Feel face and realize that not only is my hair greasy, but somehow my face is as well. Remember I washed my face in the shower this morning. Consider if it’s possible that grease from hair has traveled. 5:30PM - Get home, see roommate, hope she doesn’t notice the greaseball on top of my head. 10:15PM - Examine hair one last time before confirming that tomorrow will be the day I stop this nonsense. Remember that dry shampoo was supposed to be a key element in this experiment. Forget about it and go to bed. Day 3 - Shampoo Day. Holler. 7:30AM - Wake up, look in mirror, see greasy top knot mullet, and wonder if it’s weird to shower before a workout class. Decide that yes, that would most certainly be weird. 8:30AM - Get to Pure Barre. Sit next to a woman who tell me she just ate a donut before class. Make a mental note to be this woman’s friend. 9:15AM - In the middle of plank (when apparently I do all my serious life-contemplation) remember that today I get to wash my hair. Smile. Then fall out of plank and go back to my huffing and puffing until class ends. 10:00AM - Race home. Take a quick pic of my greasy hair for all you dear readers. 10:02AM - Jump in the shower. Wash, rinse, repeat* for approximately 20 minutes while dancing and singing aloud to Leon Bridges, confirming that this is 100% worth a second noise violation from my overly finicky downstairs neighbor. *I understand the whole wash rinse repeat thing is a huge marketing ploy to get oblivious consumers to use up their shampoo supply quicker therefore having to buy it more often. #what.ever. I am their ideal consumer. 10:15AM - Brush hair and realize it still feels a little greasy. Understand that it may take a few days of going back to my wasteful hair-washing-every-day routine for said hair to lose all grease. 11:58AM - Finish writing blog post and come to the conclusion that washing my hair only a few times a week is not the life for me. I'll leave it to the rest of Asheville’s hippie population. Though maybe next time I’ll actually buy the dry shampoo.